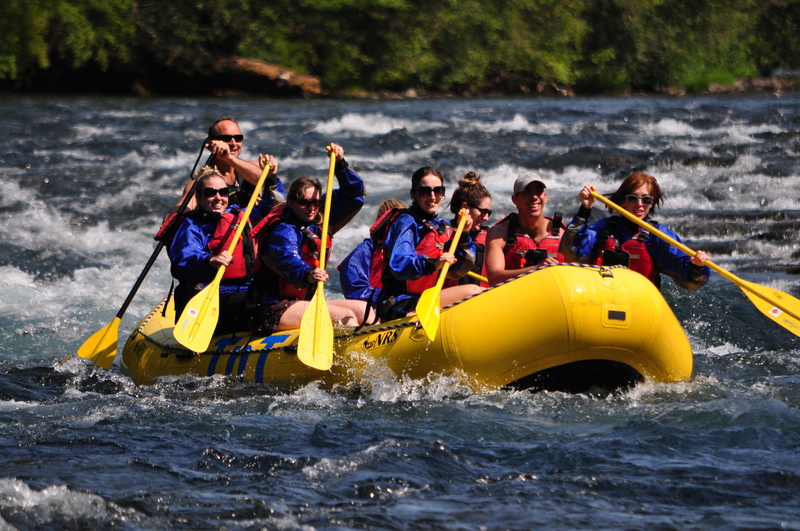 With the McKenzie River as our “office” for the day, a handful of the Eugene, Cascades & Coast staff set out on a half day adventure with TnT Whitewater Rafting. At Harbick’s Country Store in Blue River, we met with Tim Moomey, the owner and operator (along with his wife Tonya), who has been rafting rivers throughout Oregon recreationally for the past 35 years. Tim loaded us in his van and we were off to Frissell Landing. Before getting us into the water, Tim taught us the commands that he would use to guide us when we rowed, and taught us about river safety. This served as a reminder that any river comes with its potential dangers, and why it’s always important to ride with a professionally trained guide who knows the river well. After that, we strapped on our life jackets, and many of us chose to suit up in the provided splash jackets and booties -- a wise idea when you’re that far up on the McKenzie. As the snow melts, the water remains considerably chillier than what we’re used to around Eugene and Springfield. 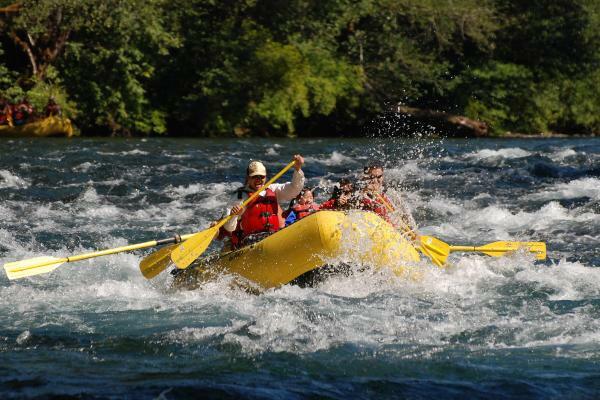 Although the stretch of the McKenzie that we explored tops out with Class II rapids, there was never a dull moment. The 14-mile expedition that ended at Bruckart Boat Landing was full of twists and turns guaranteed to send you on a bumpy and exciting ride, leaving you soaked but smiling. With names like Boomerang, Roller Coaster, and the Zipper, the rapids often make the boat feel like some sort of carnival ride as it spins and bounces through the crystal clear water. 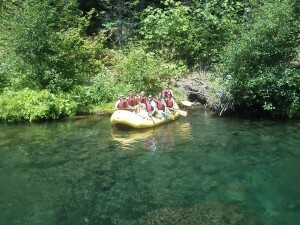 The McKenzie River is not only one of the cleanest rivers in the world but one of the most scenic. Lush green trees line the banks, and many change to beautiful amber and red tones during early autumn floats. Herons are a common site along the banks, and salmon can be seen spawning in some parts during late summer and early autumn. A number of lodges and cottages dot the riverbanks, many with people enjoying the warm weather and waving as you pass by. Our trip took us past Belknap Hot Springs as well as under Belknap Covered Bridge. Tim and Tonya’s passion for rafting is evident, and they are eager to share the experience with everyone, even when finances may be an issue. Besides offering the best prices on the McKenzie plus longer runs, the snacks and gear (including Neoprene booties, splash jackets, and in some cases, Farmer John wetsuits) are available at no additional charge. They also support community events and organizations through donations as well as work with local non-profits, and have even established a scholarship fund. TnT Whitewater is flexible with their put in and take out locations, and offers full day and half day trips. Riding for a full day provides rafters the chance to enjoy lunch along the river (snacks are provided for the half day trips). All of their guides are First Aid and CPR certified, and will go out of their way to make sure you have a memorable experience. 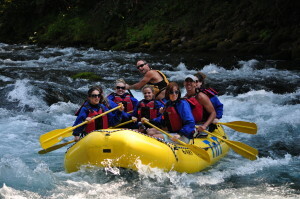 Book a trip with them by calling 541-847-6085, or visit their website at www.TnTWhitewater.com. Save 30% on your trip when you stay overnight along the McKenzie River. A special thanks to West Coast Action Photos for allowing us to use some of their images. 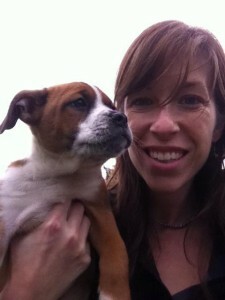 About the author: Jessica Chestnut is the Social Media and PR Manager for Convention and Sports. Although she’s only been in Lane County since 2008, there’s nowhere else in Oregon she would rather be. She spends her free time exploring the great outdoors, snowboarding, camping, floating the McKenzie, watching college football, enjoying local microbrews, and spending time with her husband and puppy.